Yep, we’ve had a couple. A rare feat to have one, rarer yet to have two. A father/son combo? Rare indeed. 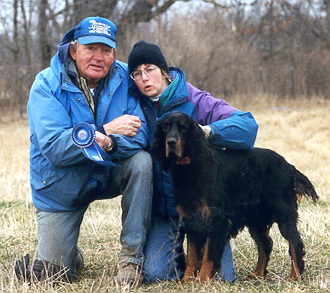 Both are Amateur Field Champions as well…..and Rater was a Master Hunter to boot! Rater went about his DC/AFC in a slightly different fashion than is the norm. 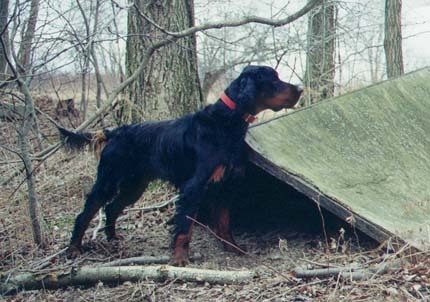 He was an AKC Master Hunter first, and belongs to a very short list of Gordon Setters that have the DC/AFC/MH set of titles. In fact he may the only one to have the MH first. And Rater's MH came pretty early....early for a Gordon Setter that is. Slightly more than 2 years 6 months. His contribution doesn't end there however. He is the sire to three Dual Champions, all out of different dams. DC/AFC Rice Creek B/Zuke WyndDancer (Rater x Ch. Chaparral Rad Aclee Clearcut SH) owned by us. DC Tarbaby Setanta T Rex (Rater x FC Tarbaby's Magnolia) Breeder: Dan Tenaglia, Owner: Frank Waters. Not all our dogs go through Rater here at Wyndancer, but he casts a big shadow on the kennel. Zuke's story is somewhat different., but still good. See, Zuke is a survivor. He survived a clash with parvo when he was a wee little lad on Christmas day 1996. He survived a bad habit of swallowing rocks, and the five intestinal surgerys. His field trial career survived after running his shoulder into a large piece of scrap metal buried in the grass. A survivor. At the dog shows and field trials, Zuke always brought the "A" game.....always. He always was "fired up" and "ready to go". Zuke never received the demand as a stud that his sire (Rater) did, but we really like the puppies he sired. Seems to be a commonly held belief, if you like a certain dog, bred to his sire. Zuke is the sire to our Pudgey, which we (and others) feel is in special class of females.